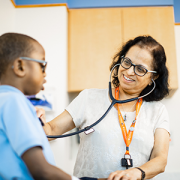 Pediatric nephrologist Asha Moudgil, M.D. examines a kidney transplant patient. As obesity has continued to rise among children in the U.S., so has a condition called metabolic syndrome – a constellation of factors, including high abdominal fat, insulin resistance, high blood pressure, high triglycerides and low amounts of high-density lipoprotein (“good” cholesterol), that increase future risk of cardiovascular disease. 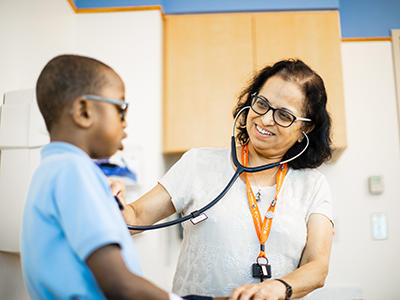 Although metabolic syndrome is dangerous in otherwise healthy children, it’s particularly so for those who’ve received kidney transplants due to chronic kidney disease, says pediatric nephrologist Asha Moudgil, M.D., medical director of transplant at Children’s National Health System. Dr. Moudgil and Children’s National co-authors, Registered Dietitian Kristen Sgambat, Ph.D., RD, and Cardiologist Sarah Clauss, M.D., published a literature review in the February 2018 Clinical Kidney Journal outlining recent research about the cardiovascular effects of metabolic syndrome after kidney transplantation. Dr. Moudgil explains that chronic kidney disease itself leads to poor growth, resulting in shorter stature that’s a risk factor for developing increased waist-to-height ratio upon becoming overweight. 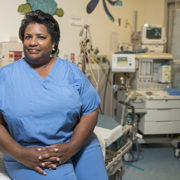 When children with this condition undergo long-awaited transplants, it reverses some factors that were suppressing appetite and keeping weight in check: The chronically high levels of urea in their blood decrease after transplant, improving their appetites; and there’s no need to maintain the restrictive diets they had been required to follow for kidney health prior to transplant. The pharmaceutical regimen that patients follow post-transplant often includes steroids that independently contribute to weight gain and insulin resistance. Combined with the typical American high-fat, high-sugar, and high-sodium diet and low levels of physical activity, the majority of patients with chronic kidney disease gain significant weight after they receive transplants. The prevalence of obesity doubles the first year after transplantation, from about 15 percent to 30 percent, not only driving up cardiovascular disease risk but endangering the longevity of their transplant. At the same time, says Sgambat, risk factors before and after transplantation drive up prevalence of other parts of metabolic syndrome. These include hypertension, which affects the majority of patients with chronic kidney disease before transplant and typically worsens due to sodium and water retention from immunosuppressive drugs. Dyslipidemia, or abnormal lipid concentrations in the blood, is also common among pediatric kidney transplant patients. 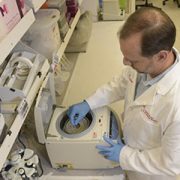 One study included in the review showed that 71 percent of patients had high triglycerides three months post-transplant. Ethnicity also can drive up risk for metabolic syndrome and cardiovascular disease. 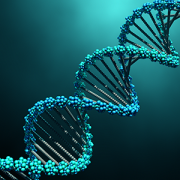 For example, the literature review says, individuals of African descent have a higher risk of these two conditions potentially due to genetic factors, such as high risk apolipoprotein L1 gene variants. Together, these factors spur production of inflammatory molecules that trigger the development of early cardiovascular disease. 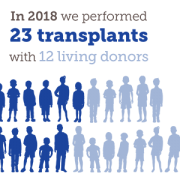 Many kidney transplant recipients die from cardiovascular complications in early adulthood, Sgambat says, driving the need for early detection. To that end, Dr. Moudgil says pediatric patients don’t typically show overt abnormalities in standard measures of cardiac functioning, such as echocardiography. As an alternative, she and colleagues cover three tools in the literature review that could offer advanced insight into whether patients have initial signs of cardiovascular disease. One of these is carotid intima-media thickness, a measure of the thickness of the carotid artery that can be obtained noninvasively by ultrasound. Another is myocardial strain imaging by speckle tracking echocardiography, a global measure of how the heart changes shape while beating. 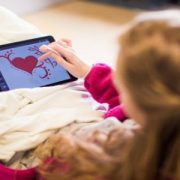 Cardiac magnetic resonance imaging (MRI), a relatively new technique, is already showing promise in detecting signs of early cardiovascular dysfunction. A far simpler way to gauge cardiovascular risk, Sgambat adds, is calculating patients’ waist-to-height ratio. This measure doesn’t require sophisticated tools and can be tracked in any clinic over time, alerting patients to health-altering changes before it’s too late.